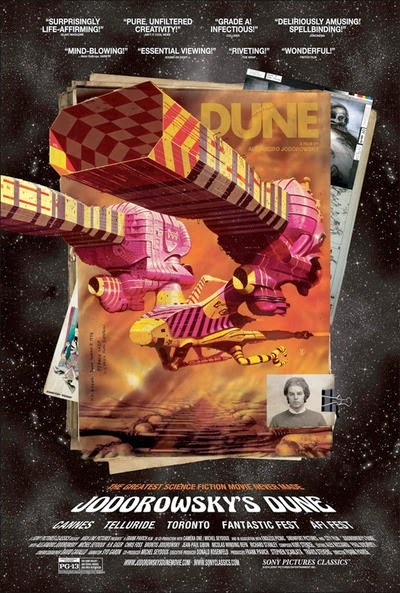 One of the more famous movies never made was an adaptation of Frank Herbert's science fiction novel Dune that was kicking around in the mid seventies. Cult film director Alejandro Jodorowsky wrote the screenplay and would have directed, with Michael Seydoux producing. It got pretty far along in pre-production, but ultimately no studio was willing to come up with the necessary budget to make the film and it fizzled out. And yet the legend of the film persisted among science fiction fans and admirers of Jodorowsky. The idea of the man responsible for visually stunning acid-head epics like EL TOPO and THE HOLY MOUNTAIN tackling one of the avowed classics of science fiction literature is a tantalizing “what if?” that will never really be answered. Thanks to director Frank Pavich's documentary JODOROWSKY'S DUNE, however, we at least get some idea of what such a film might have been like. The affable Jodorowsky, now in his eighties, walks us through his process in choosing to make the film, adapting the screenplay, and choosing the “warriors” who would make it with him, starting with storyboard artist Jean Giraud Moebius. Complimenting those storyboards were spaceship designs by sci-fi paperback artist Chris Foss, and additional set design by Swiss artist H.R. Geiger. Dan O'Bannon was contracted to provide the special effects. Cool rock bands were recruited to provide original soundtrack music, including Pink Floyd and Kraut rockers Magma. Even most of the cast was in place – Jodorowsky's son Brontis would play the lead, with David Carradine, Mick Jagger, Orson Welles, and Salvador Dali in key supporting parts. Without any actual footage to show since none was ever shot, Pavich utilizes the artwork and interviews with the participants to give some sense of the film that might have been. It all looks and sounds incredible, but of course a movie isn't a movie until it's filmed and edited. There's no telling whether Jodorowsky's version of DUNE would have been the life changing, consciousness-altering experience he envisioned, or just another ambitious train wreck like the David Lynch version of the film that eventually did get made and released in 1984. What is certain is that this documentary is both informative and entertaining, arguably conveying as much about the filmmaking process as any behind the scenes or making of feature on films that were actually completed. 4 out of 4 stars.